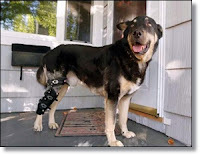 When the package was snatched from Rummy’s doorstep Aug. 20, the thief nabbed a custom-made brace designed to help the dog heal from a knee injury. At least that’s what appears to have happened, since the package was delivered to the home on Moss Avenue, but never found. Rummy’s human companions Tom McDonnell and Kathy Gray, a Chico State University mathematics and statistics professor, waited about a week before ordering him another $900 brace, hoping the missing package would be returned. Posh Dog Knee Brace, the orthotic canine brace company that crafted Rummy’s device, even posted a $150 reward on Craigslist, no questions asked.